So what is a Maltese cat? The term is used to describe any domestic cat of unknown breed whose coloration is mostly solid gray or solid blue. Some cats have a combination of both colors. But why Maltese? Interestingly, cats with gray or blue fur are quite common in Malta, a small island state located in Southern Europe. Are all cats in Malta blue or gray? Not at all, you can find any type of cats there, but there are many a blue and gray colored cats so the name stuck. Now, I said previously that Maltese cats are of indeterminate breed. However, there are cat breeds that exclusively generate blue or gray fur. 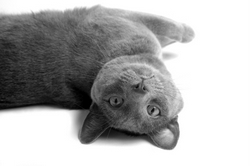 Examples of these breeds are the Chartreux, the Korat, and the Russian Blue. Then again, Maltese felines are non-pedigreed cats. -The term "maltesing" is another term used to describe the dilution of the color of a cat’s fur. So if a cat has the dilution gene, the color of his fur will be paler than the original color. Variations in color due to the dilution gene occur in calico cats, for example. -"The Maltese Cat" is the title of a short story penned by Rudyard Kipling. But it has nothing to do with cats! In fact, in the story, "The Maltese-Cat" is the name of a pony. -Did you know that there are also Maltese dogs? And they’re not from Malta either. Maltese dogs are a type of toy dog with long white hair. -Tom (the bluish-gray cat from Tom and Jerry fame) is believed to be a Russian blue cat. Enjoy this collection of images of the cats of Malta. -Posters and art prints of blue or gray cats make great gifts for cat lovers. -You may give posters and calendars of breeds like the Russian Blue and the Chartreux. -Other inexpensive ideas include magnets and t-shirts showcasing blue or gray cats.